Southern stem canker, caused by Diaporthe phaseolorum var. merdionalis, and northern stem canker, caused by Diaporthe phaseolorum var. caulivora, appear to be geographically limited, and southern stem canker is endemic throughout the south. Diaporthe phaseolorum var. caulivora is also characterized by the absence of asexual spores. 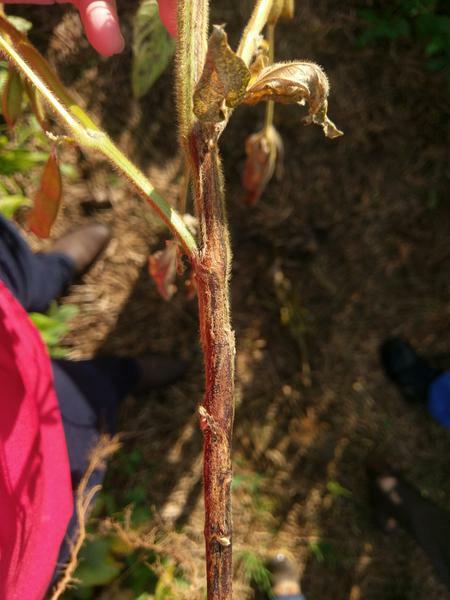 Soybean and several weed species (sicklepod, smallflower morning-glory, hemp sesbania, northern joint-vetch, entireleaf morning-glory, hairy indigo, and wild poinsettia) have been implicated as hosts for the stem canker pathogen. Symptoms are typically observed during the reproductive phases of the plant; however, initial infections typically occur during early vegetative growth. Initial stem symptoms are characterized by small, reddish-brown lesions on the main stem at the base of a lower node. As the lesion expands and elongates, it becomes sunken with dark brown to black margins (Figure 1). The vascular tissue near the canker also becomes discolored when lengthwise section of the stem is cut. Small black spots (stroma) may also appear on the dead tissue within the canker. The stroma are compact masses of fungal hyphae in which perithecia (the sexual fruiting structures of the fungus), will appear given adequate moisture. Lesions may expand down towards and below the soil line, and may be confused with other root rots. Foliar symptoms appear at the onset of flowering and begin as interveinal chlorosis that become necrotic as the disease progresses (Figure 2). Dead leaves often remain attached to the stem. The symptoms of this disease are similar to other common diseases in North Carolina. 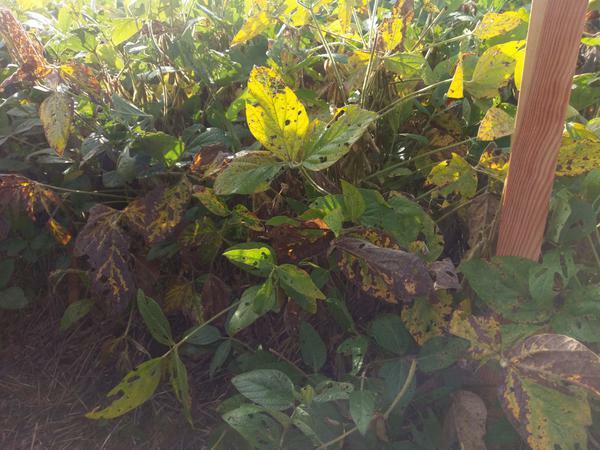 Submission to the Plant Disease and Insect Clinic may be necessary for proper diagnosis. Figure 1. Stem canker lesions on soybean begin at the first nodes of the plant and expand up and down the plant. Figure 2. Interveinal leaf necrosis associated with infection by D. phaseolorum. Leaf symptoms may be easily confused with those caused by Phytophthora root rot or sudden death syndrome. The fungus overwinters on infected plant debris in the soil, which may remain viable for several years. The fungus produces spores during rainy weather, and may be splash dispersed to the lower stem of the plant. Long periods of wet weather early in the growing season favors stem canker, and infections occur in the early vegetative growth stages of the plant. Seed may be infected by fungal spores; however, fungal spores from infested residue are often the primary source of inoculum. The best management method for stem canker is to plant resistant soybean varieties. Rotation with a non-host crop, such as corn, wheat or sorghum, may help reduce the amount of inoculum available to infect the next soybean crop. No-till or conservation tillage may promote the survival of the stem canker fungus. Fields with a history of stem canker are at high risk for stem canker infections due to the long duration of survival of the fungus on crop debris. There is not yet data to support the efficacy of foliar fungicides for the management of stem canker. See the North Carolina Agricultural Chemicals Manual for information on fungicides recommended for soybean disease management.